Mila NS is a 6-eye, women's specific soft toe lace-to-toe heritage work shoe. Rich, oiled leather uppers, with padded collar and tongue to provide secure comfort, while the moisture wicking lining and anti-bacterial Softwair insole keep you dry and safe. 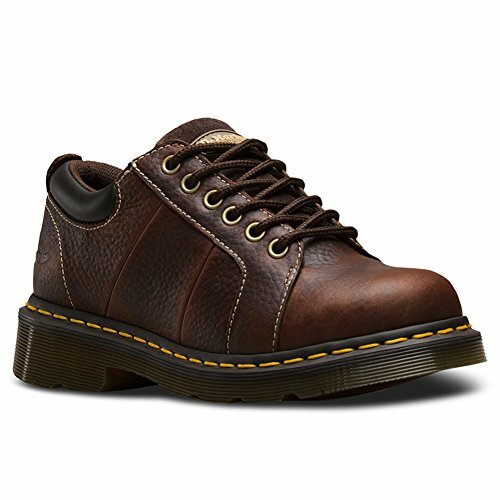 Dr.Marten's classic air-cushioned sole is resistant to oil, fat, petrol and alkali. This Mila style was designed for multi-purpose work and service industries. The slip resistant sole reduces the risk of slips and falls on hazardous surfaces. Also offers additional insulation and protects the wearer against accidental contact with an electric charge. Safety standard: ASTM F2892-11 EH. The upper and sole are heat-sealed and sewn together, not merely glued like many footwear constructions. Milled, printed heavy oiled full grain leather. Material: Leather, PVC.